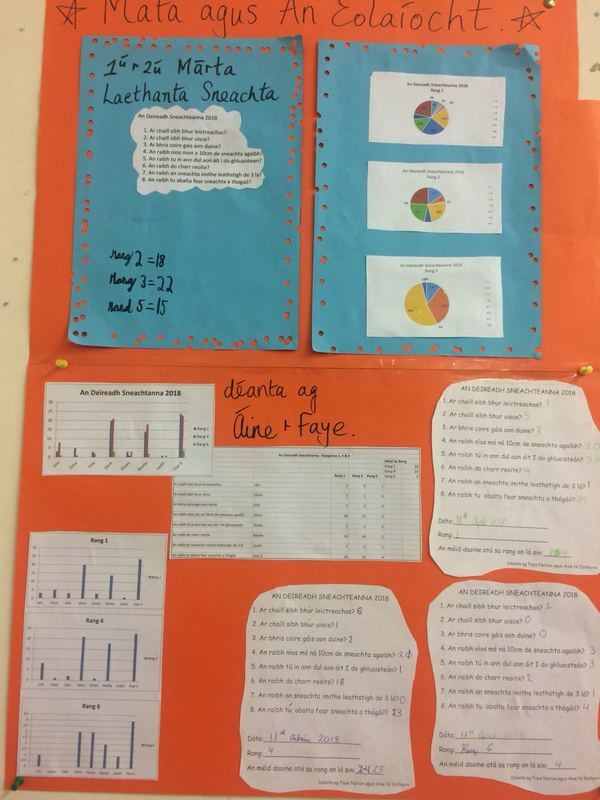 Tá Discover Primary Science and Maths (DPSM) an clár náisiúnta chun suim a spreagadh san eolaíocht, mata agus innealtóireacht i measc páistí bunscoile. Cuireann na scoileanna a ghlacann páirt réimse gníomhaíochtaí eolaíochta agus mata i gcríoch sa seomra ranga agus cuirtear gníomhaíochtaí agus tionscadail eile i gcríoch freisin cosúil le turasanna chuig ionaid DPSM, cuairteoirí eolaíochta/innealtóirí a fháil nó freastail ar imeachtaí eolaíochta. Cuirtear gradam Eolaíochta agus Mata ar fáil do scoileanna a ghlacann páirt níos gníomhaí sa chlár agus a chuireann gníomhaíochtaí breise i bhfeidhm. 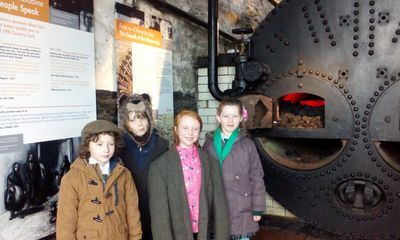 Ta Gaelscoil Mhuscraí taréis an gradam seo a bhaint amach gach bliain ó 2008. Discover Primary Science and Maths (DPSM) is the national programme to foster interest in science and engineering among children in primary schools. 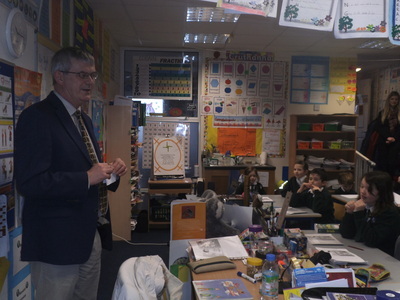 Participating schools carry out a range of science and maths activities in the classroom and also undertake additional explorative activities and projects such as visiting DPSM centres, attending/holding science events or inviting science speakers/engineers to the school. An Award of Science and Maths Excellence is available to schools that go beyond basic participation and carry out a minimum requirement of additional explorative activities. 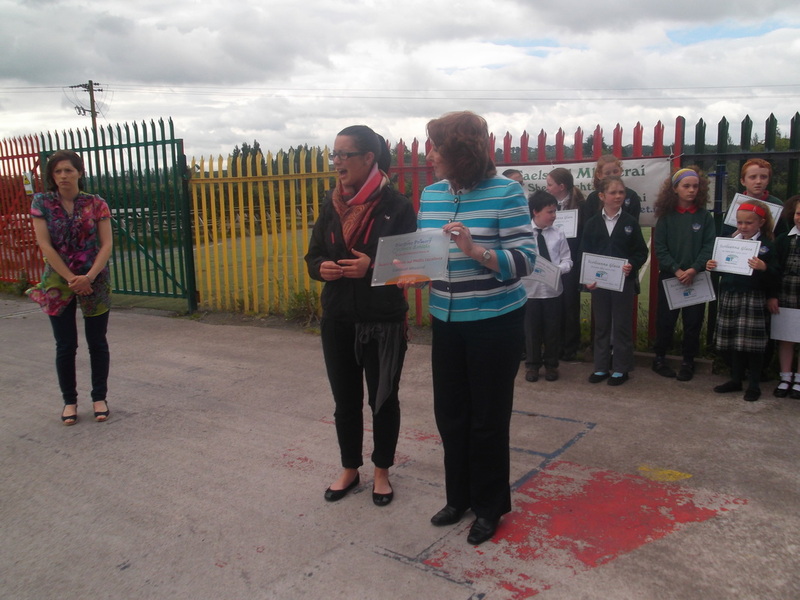 Gaelscoil Mhuscraí has been in receipt of this Award every year since 2008. 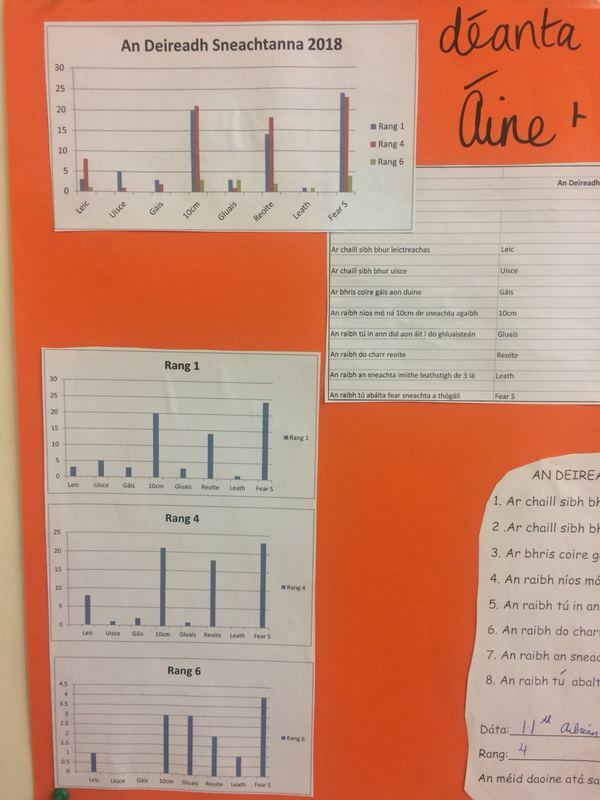 Ghlac Rang 4 páirt in aonach eolaíochta bunscoile i gColáiste Mhuire Gan Smál i mbliana lena dtionscadail faoi leasúchain nádúrtha. Bhain gach páiste árd-taitneamh as! 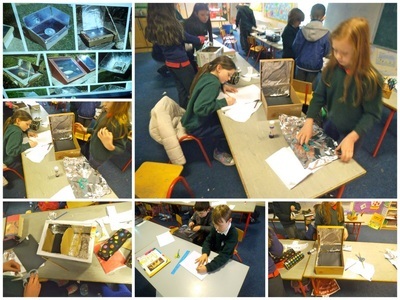 4th class showcased their science project about natural fertilisers at the Primary Science Fair in Mary Immaculate College in Limerick. 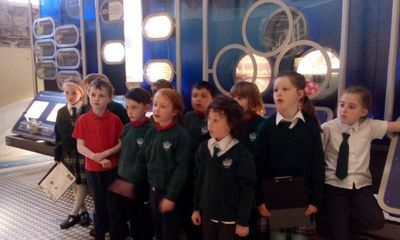 They enjoyed taking part and learning about all the other science projects at the event. Rinne Rang 4 turgnamh ar stáirse a iniúchadh. Féach ar na pictiúir ar chlé. 4th class carried out an experiment on starch. Have a look at the pictures on the left! Bhí na naíonáin ag iniúchadh ábhair éagsúla chun an difríocht idir gharbh agus mín / crua nó bog a thuiscint. Féach sall dona pictiúir. Infants played 'pass the parcel' as they investigated whether different materials for wrapping a parcel were rough or smooth, hard or soft.See pictures on the right. Teicneolaíocht - Dhéan Rang 3 sleamháin féna dturgnamh ar ghluaisteán maighnéadach. Bhí scileanna Mata & Innealtóireachta in úsáid acu freisin. ​Technology - 3rd class created a Powerpoint presentation to present their experiment on a magnetic car. They used their Maths & Engineering skills during this experiment also. Dhéan na hárdranganna turgnamh ar fhuinneamh & fórsaí ag dearadh agus ag deanamh roichéad cúir. Bhí an-bhaint ag Mata & Innealtóireacht leis an dturgnamh seo maidir le uilleannacha & fad. Féach ar na pictiúir ar chlé. Our senior classes designed and made a rocket as part of the Energy and Forces strand. Maths & Engineering was integrated into this experiment with a focus on angles and length. See pictures on left. Rinne Rang 1 turgnamh ar ghluaiseacht aeir a iniúchadh. Bhí rásaí acu sa deireadh. Cé acu a bhfuil na scámhóga is fearr acu? Féachaigí ar conas ar éirigh leo! 1st Class experimented on moving air. They raced against one another to see who had the best set of lungs! See pictures on right. 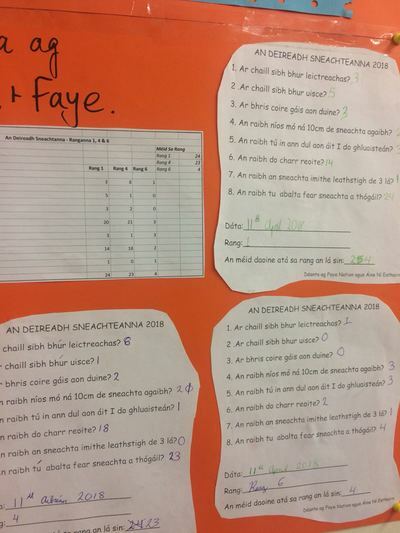 Bhí rang a haon ina nInnealtóirí don thráthnóna ag forbairt sláthach! 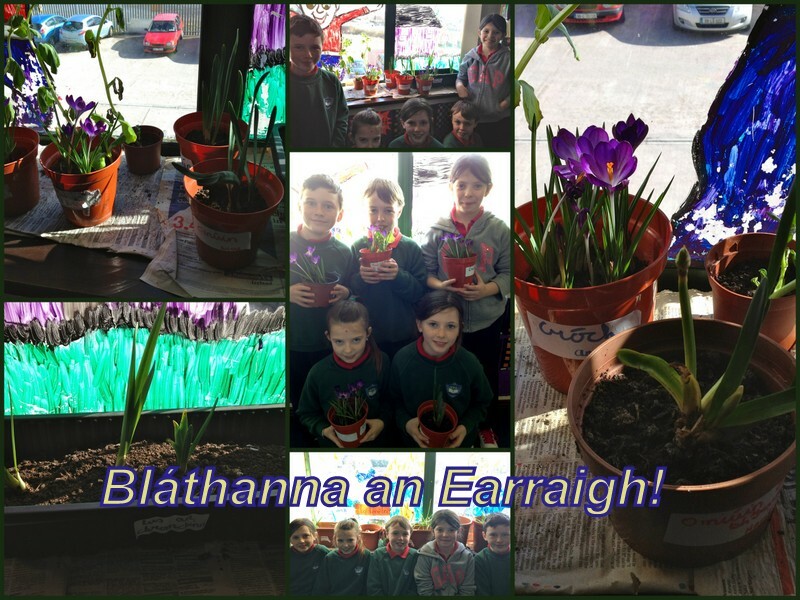 Ag úsáid gliú PVA, dath bhia, uisce, málaí plaisteacha is Borax d'éirigh leo a gcuid sláthach féin a dhéanamh! Féachaigí ar na grianghrafanna! 1st class were Engineers for the day making slime! They used PVA glue, water and borax to make their own slime. Take a look at the photos. Bhí na naíonáin mhóra ag foghlaim faoin timpeallacht agus athchúrsáil. Dhéanadar beathadáin éan agus chrochadar suas iad amuigh sa chlós agus bíonn siad ag faire amach dona héin difriúla ag baint taitneamh as a mbeathadóir nua! Senior Infants were learning about the environment and living things. They made wonderful bird feeders and they are hanging in the school yard so the infants can watch the different birds feeding! Thug Rang 1 cuairt ar na hoibreacha uisce i mí Aibreán. D'fhoghlaim na páistí faoi fhuinneamh, uisce agus dramhaíl i measc an-chuid rudaí eile eolaíochta. 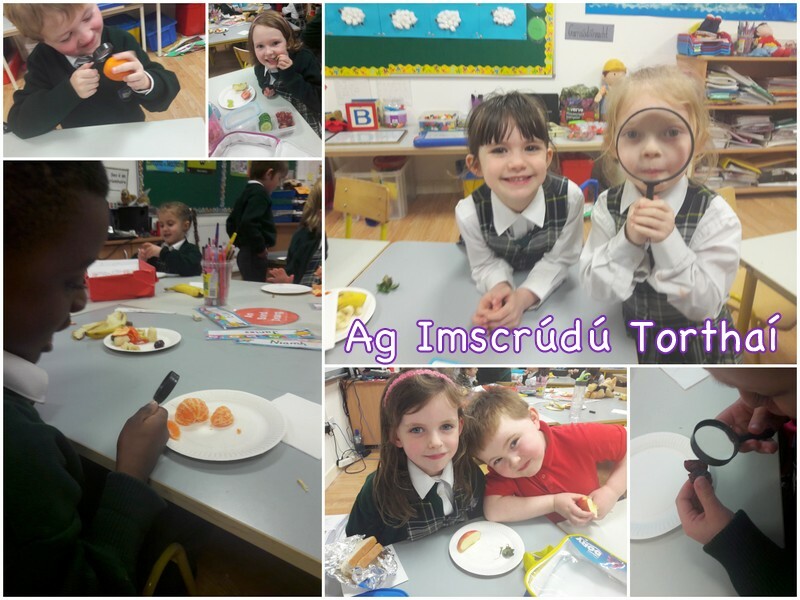 Bhí an turas seo mar chuid den chlár Discover Primary Science. 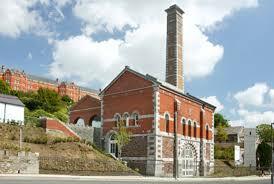 1st Class paid a visit to the old Cork waterworks experience at Lifetime Labs in April. 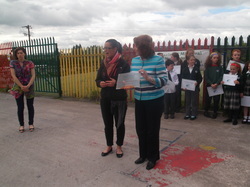 The students learned about energy, water and waste and a whole range of other environmental issues. This expedition formed part of the school's participation in the Discover Primary Science & Maths programme. 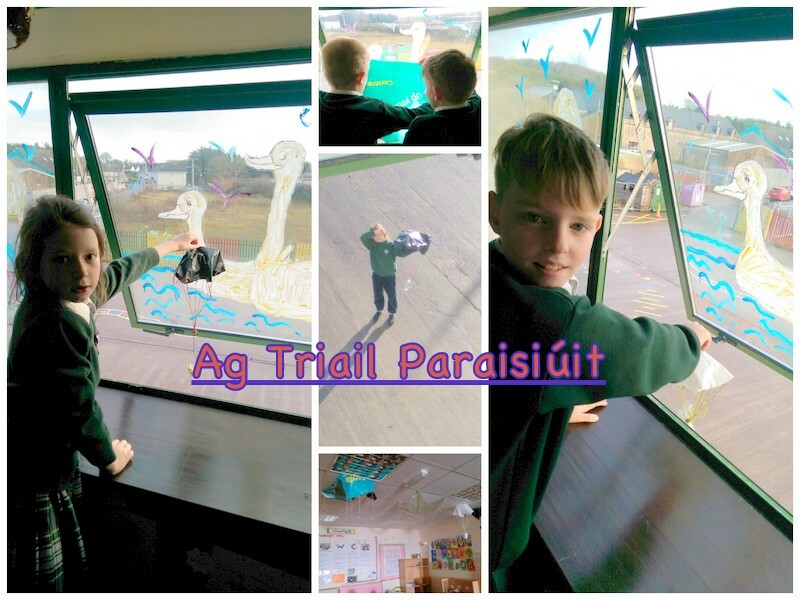 Mar chuid dár n-obair ar an scéim Scoileanna Glasa, áit atáimid ag obair i dtreo brat glas don taisteal, bhí roinnt eolaíochta agus mata ar siúl. D'oibrigh ranganna cosúil le innealtóirí ag dearadh fionnachtain don timpeallacht agus rinne baill don Choiste Glas suirbhé ar na páistí faoi mhodhanna taisteal iompair. Léiríodar torthaí an suirbhé seo ar ghrafanna. As part of our work on our Green Flag for Travel we have been working as scientists and engineers. Rang 3 became environmental engineers designing an invention to help the environment. Our Green School committee carried out a travel survey and recorded the results on graphs. 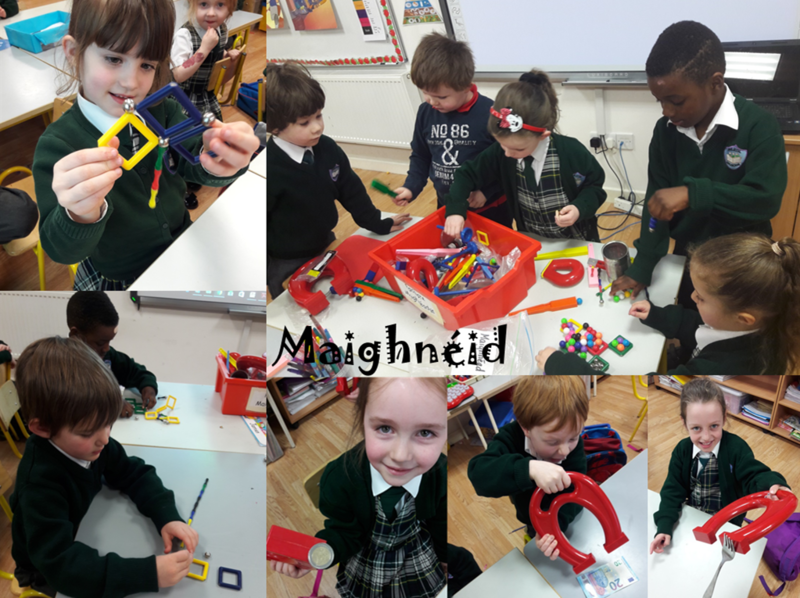 Tháinig Learnit Lego chuig na scoile chun ceachtanna STEM a dhéanamh lena páistí ag úsaid Lego. Bhíodar ag dearadh, ag tógáil agus ag fiosrú cosúil le innealtóirí cearta. 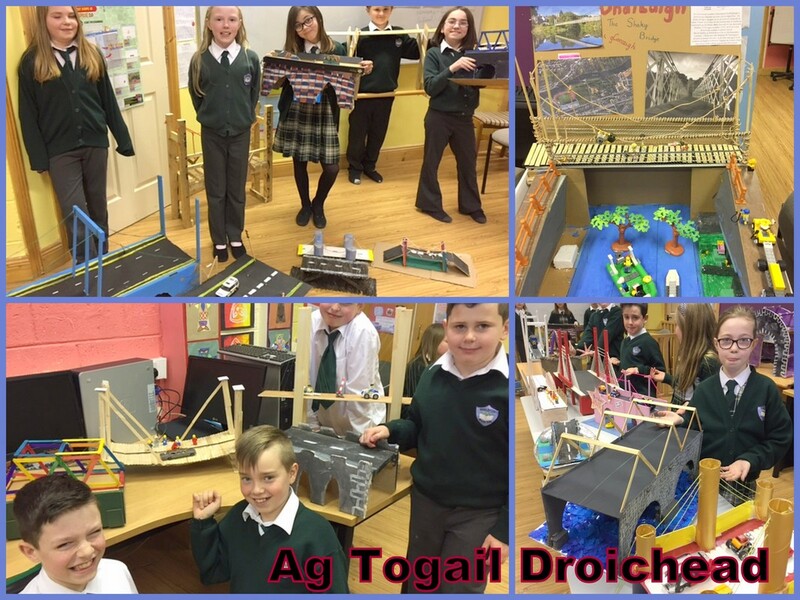 Bhí páistí na scoile fíor-ghníomhach i rith an tSeachtain Eolaíochta 2016 ag tógáil roinnt meaisíní le LEGO. 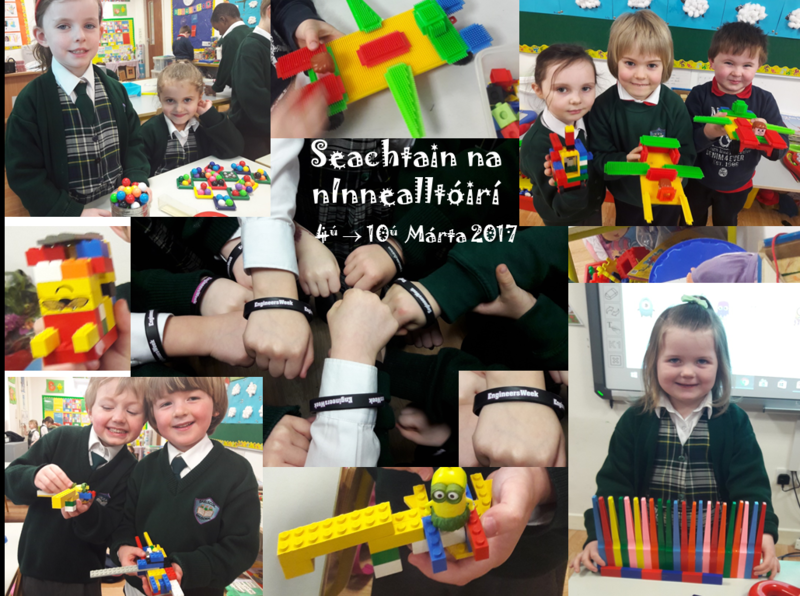 Tháinig 'Learnit' Lego chuig na scoile chun scileanna innealtóireachta a mhúineadh do pháistí Rang 1- 6 i rith céardlannaí éagsúla. Bhain gach páiste fíor-thaitneamh as an bhfoghlaim ghníomhach seo. Bhí Rang a 1 ag foghlaim faoi conas a shúann plandaí uisce trína fréamhacha. D'úsáid siad dathúcháin bhídh chun an turgnamh a dhéanamh. Tá siad ag obair go dian mar eolaithe óga chun gradam Discover Primary Science eile a fháil! First class have been busy investigating how plants absorb water through their roots. They used food colouring for the experiment. 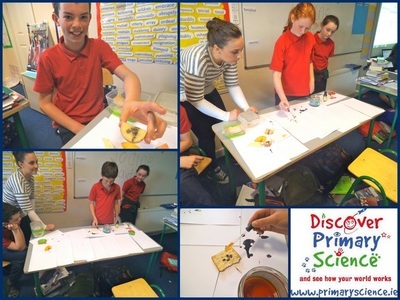 They are working hard as budding scientists to achieve another Discover Primary Science award for our school! Tháinig Cruinneacháin na Réalt ó Réadlann Chaisleán na Dúcharraige ar cuairt chugainn i mí Eanair chun an córas na gréine a thaispeáint go beacht cruinn dona daltaí. 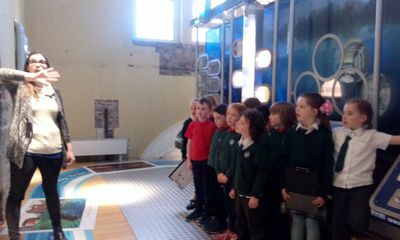 A mobile 'StarDome' visited yesterday from Blackrock Castle Observatory to showcase the wonders of the night sky. This portable planetarium formed part of the school's participation in the Discover Primary Science & Maths Award of STEM Excellence. D'oibrigh na hárdranganna mar innealtóirí nuair a bhíodar ag dearadh 'is ag déanamh droichid. 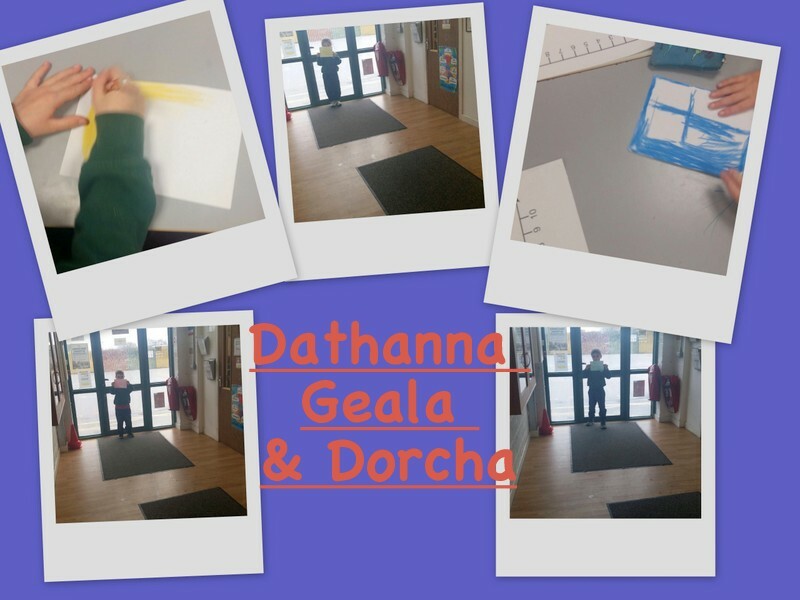 Deineadh samplaí iontacha de réimse leathan de droichead éagsúla agus cuireadh ar thaispeántas iad don chuid eile den scoil! 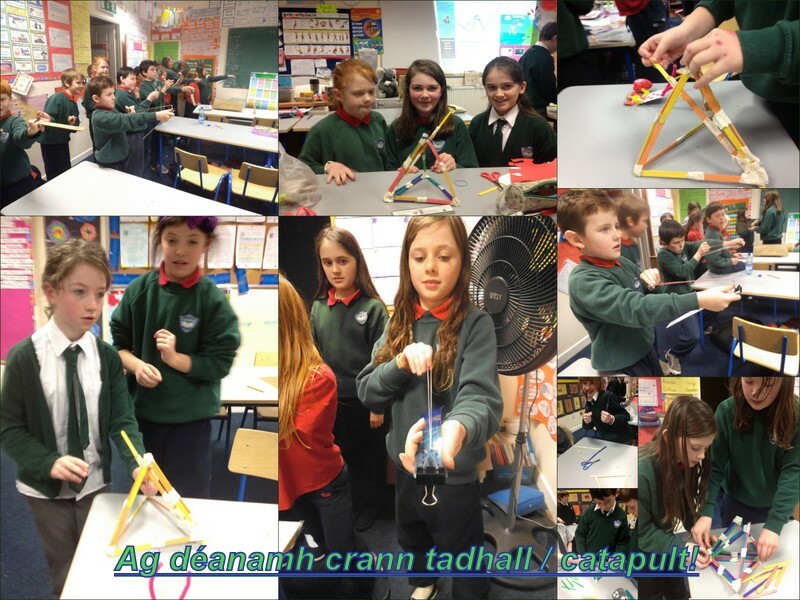 Tá obair dochreidte ar siúl ag na hárdranganna mar chuid den chlár Discover Primary Science and Maths. Dhéanadar teirminéadair, brící stroighne agus roicéadaí! Níl aon teora lena scileanna eolaíochta. Féach ar an bhfiseán thíos. Senior classes are doing incredible work as part of the school's participation in the Discover Primary Science and Maths programme. 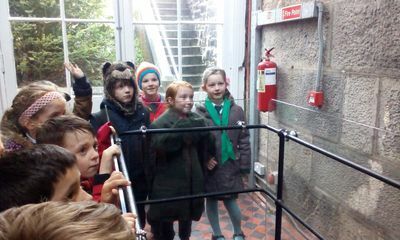 They have made thermometers, concrete bricks and rockets! 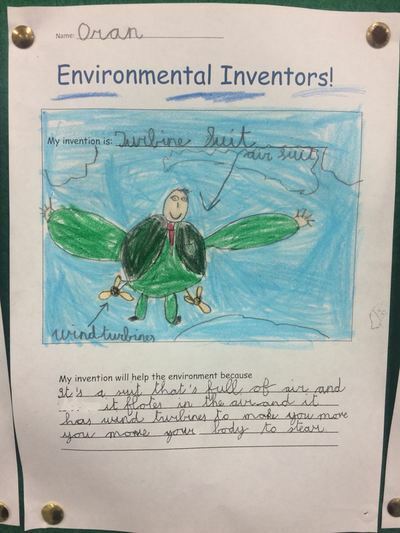 We have many budding scientists in the making - take a look at the video below. Tháinig Brian isteach agas labhair sé faoi gach saghas innealtóir cáiliúil ó Éire.Labhair se faoina phost agus cad a dhéanann se gach lá mar innealtóir. Dúirt mé leis go n-oibríonn mo dhad mar innealtóir meicniúil. Feicfimid innealtóirí amárach freisin nuair a rachaimid ar thuras chuig Ionad Uisce Coireála Inniscarra agus damba ESB. Déanfaimid blogáil faoi sin freisin! D'fhreastail ranganna 3 & 4 ar chéardlann eolaíochta i gCaisleán Charraig Dhubh áit a d'fhoghlaimíomar faoi roicéadaí. 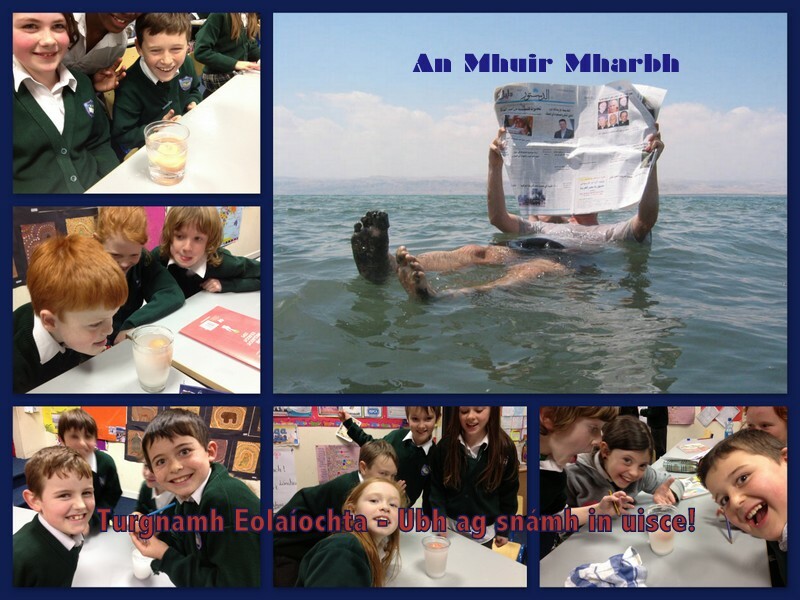 Deineadh é seo mar chuid den chlár Discover Primary Science and Maths. Lá taitneamhach a bhí ann. We attended a science workshop in Blackrock Castle Observatory where we made racing rockets. 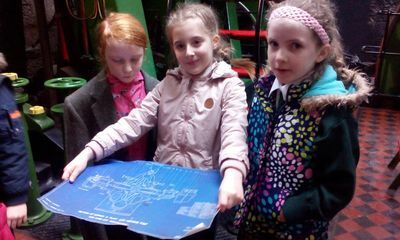 This was all part of the school's Discover Primary Science and Maths programme. An enjoyable day was had by all involved! See pictures below. Do sheachtain na n-innealtóirí bhí na meánranganna gnóthach ag fiosrú fórsa. Dhéanamar crainn tabhall ag úsáid rialóir agus clipeanna agus ceann eile ag úsáid maidí líreacáin agus leaisteach - bhí comórtas eadrainn féachaint chuici ceann is éifeachtaí! Comhghairdeas dóibh siúd a dhéan sár-jab. 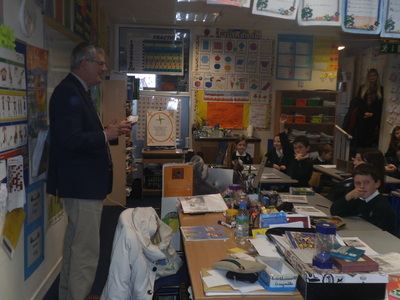 For Engineers Week the middle classes were busy investigating forces in science. We designed two types of catapult - one with rulers and bull clips and another using lollypop sticks and elastic bands. We investigated which group made the most effective catapult. Congratulations to those that succeeded!